The Mendocino Coast is a pretty amazing place to kayak. It has everything you could want - big swells, mellow days, rock gardens, sea caves, tidal rivers, a little whitewater, and breathtaking scenery. It also has some surf. And there are some good surf days. But the truth is that most of the surf spots are a little junky most of the time. There aren't any place that consistently get good surf conditions. 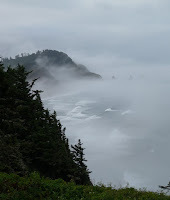 The mouth of Big River, just south of Mendocino, is a place that always has surf. Some days it even works well as a teaching spot. But it's never very good. To see what you want to see, you have to know what you’re looking for. That’s a little trickier than it sounds. When paddling along a coast there are some obvious things to look for. The beautiful scenery, the ocean waves, your paddling companions. But what are you looking out for? What are the important signs of possible danger? What should you pay attention to and what do you need to anticipate. How do you spend all your time being aware of hazards and still enjoy yourself? 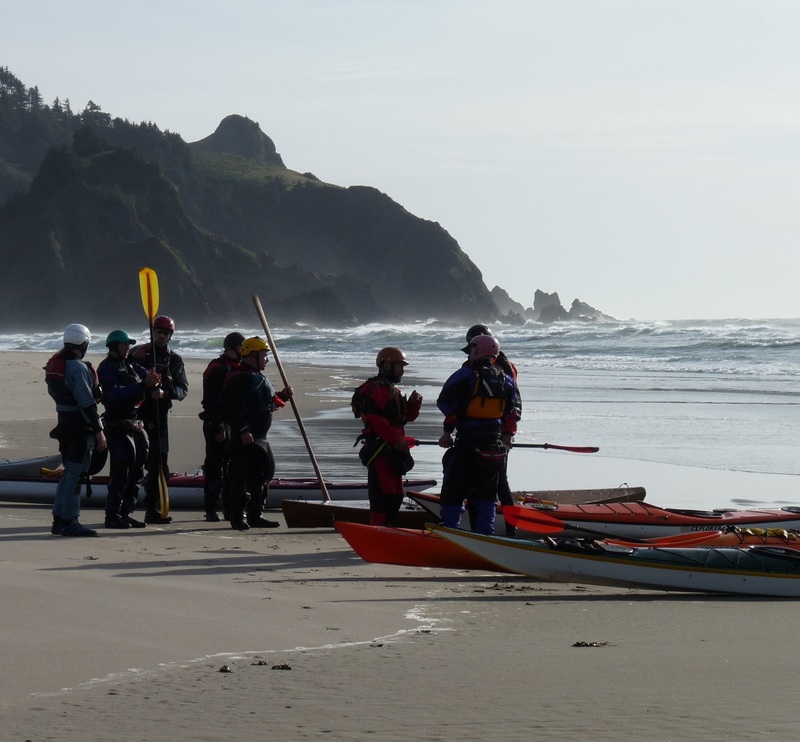 We all want to have fun when we paddle – that’s the whole point – but in a dynamic and possibly dangerous environment like the open coast you also need to constantly be watching for changes that might put you at risk. You need to know what’s happening, what could happen, and what you and your partners can do to deal with whatever does happen. It’s a general concept, lacking in specifics by its very nature, but it is something you can practice and improve. You have to be aware, and awareness needs to be a continuous and fluid thing. If you’re trying to follow a checklist or a bunch of rules, you won’t do it as often and you’ll miss out on the beauty that’s around you. Awareness is a state of mind that you have to work at reaching, rather like meditation. Not only does it make you a safer boater but it lets you get more out of your paddling experiences. In theory you’re paying attention to everyone and everything. That can seem overwhelming. Start by making sure you’re not focused on any one thing. Many people paddle just watching the boat in front of them. Or maybe the birds. Or maybe they get lost in a great conversation with the person next to them. You really can’t afford to do that on the ocean. Always keep looking around. Count the paddlers in your group. Look behind. Look up. Make sure to change your focus frequently and you’ll actually appreciate a lot more of the world around you as well and increase your awareness of risks. The goal is to see the bad things coming before they arrive. You don’t want to all of a sudden realize the wind is very strong or that wave is very close. The truth is most disasters unfold slowly on the ocean, over a matter of hours. People get cold, conditions deteriorate, the group gets farther and farther from safety. These things start as small problems and grow, but if you see what’s happening when it’s still very manageable you can make small corrections that change the trajectory of the outing. Ask the person next to you if they’re warm enough. Figure out why your boat keeps wanting to go to the left. Stay close to shore if it feels like the skies are darkening. You have to see the problem building in order to cut it off while it’s small. Information is your friend. Judgment is what you do with the information you are now aware of. It’s deciding a course of action, a route through the rocks or where to position yourself in the group. Whether to press on or turn back. It’s not always about making the safe choice – the safest thing is to never be out there – but about understanding the consequences of your actions and making sure you can handle the possible outcomes. It’s about balancing risk and reward, exposure and experience. Without good information you can’t make a good decision. And out on the coast you are constantly making decisions, which is why you have to always be aware. The key is to start making those decisions with conscious thought instead of letting happenstance and habit dictate your actions. Gather the information you need by observing the physical world and consulting your own experience. Don’t be afraid to ask questions and get feedback from your companions, those who might know more and even those who definitely know less. Everyone is a part of the equation. The hardest part to this for beginners is that they start out letting someone else make their judgments for them. It’s natural. Your instructor has more experience and knowledge so you let them decide. You join a club and head out on a group paddle with a strong leader. You go out with your more experienced friend who got you into the sport in the first place. It’s not only easier to let someone else decide, it allows you to pretend the risk doesn’t even exist. It takes away your responsibility and who wants responsibility when you’re having fun? Eventually that attitude will hold you back and put yourself and others at risk. So start learning how to handle things yourself right from the start. Start by asking your instructor why they made that decision. Ask them what they see when they look out at the surf. Check your own compass while you’re following the leader. Try to guess if the group will go inside or outside that rock (and guess who’s going do the opposite of everyone else). Even if the decision is up to someone else, make up your own mind and see if it agrees with them. If not, start a discussion (not an argument) to find out why other folks came to a different conclusion. Paddle with your betters but aspire to be their equal. Recognize it takes time and effort to get there. You don’t need to rely on the ‘experts’. Sometimes very skilled paddlers still have bad judgment. Sometimes they just have a greater comfort with risk. Sometimes they’re not around. 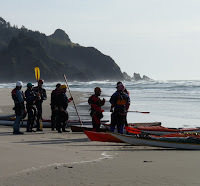 If you’re paddling with peers, or maybe you’re the leader of the group, still ask for help. More people means more information, and good leaders take it all in. Ultimately someone needs to make a decision – non-decisions left up to the vagaries of groupthink are almost always bad. Consensus is fine as long as it’s spelled out. You need to know what others are thinking and feeling if you, or anyone, wants to make a good decision for a group. Ultimately someone has to speak the plan or lead the way. The good paddlers are making these informed decisions constantly. They also keep a flexible frame of mind. Goal-oriented activities are the nemesis of good judgment. If you’re set on launching from a certain beach, traveling a certain distance before calling it a day, or feel a need to prove yourself to your peers, your judgment is likely to be impaired. It is possible to set and reach goals and retain good judgment, but it makes it harder. It helps to build up your judgmental experience by taking the pressure off yourself. Let your sense of what is safe and reasonable decide what your goal should be, not the other way around. Be willing to miss out on a good experience in order to avoid a really bad one. The theory is to be aware and make conservative decisions. By having that as your goal you are already steps ahead of the pack. Here are some things you can do to get further ahead. Start with the big things. You should already know the forecast for the weather (see the previous post in this series), but you need to pay attention to how the weather is changing. Pay attention to the clouds in the sky – puffy white clouds are pretty but a line of grey clouds means something else. Watch the sea state – not only will you see if it’s getting windier but you’ll have a better chance at spotting whale spouts or sea lions popping up for a visit. Feel the swells pass under you – you’ll connect with the ocean and improve your paddling while also learning the pattern of sets for the day. That same mode of thought applies to deciding where to go. When you look at the rocks, notice how the waves roll over them or deflect around them. It’s fascinating to see the interaction of water and stone, and also very informative to see how different size sets behave differently. Just like in the surf zone, patience is your friend as you evaluate ocean features. Feel the wind on your face when you look around to pinpoint the direction it’s coming from. Look at the sky in that direction since it’s headed your way. Count the whitecaps you see – are their more where you’re headed? That means it’s windier over there. Outside of the physical environment, the most important thing to keep watching are your friends. Where are they going? What are they doing? Are they all still here and upright? Checking in early allows you easy opportunities to avoid future difficulties. Offer that chilly person an extra warm hat or a snickers bar before they get hypothermic. Stop and fix the footpeg instead of constantly doing sweep strokes until your arm tires out. Notice your buddy’s stern is riding low and realize the hatch cover isn’t on tight while you’re still close enough to shore to make it back if you can’t fix it on the water. Some things are hard to see but if you ask a few questions you’ll learn a lot. And what you didn’t notice someone else might have. The strength of any group is their combined skills, awareness included. Aside from the physical, learn to consider the psychological – it’s an important part of group dynamics and the key to smoothly functioning paddle trips. Is everyone comfortable with the route and conditions? Does everyone have the skills to deal with what might be faced? Communication is the key to group decision-making and getting everyone involved early is necessary to facilitate making the tough calls when things go sideways. In the end, someone needs to speak the plan and you'll get more agreement (and a better plan) if everyone has contributed and feels free to share their thoughts. There are many ways to arrive at a decision. Some people suggest formulas, like the bulls-eye method developed by Body Boat Blade, which is good when making big decisions like deciding whether or not to launch (brief overview here). 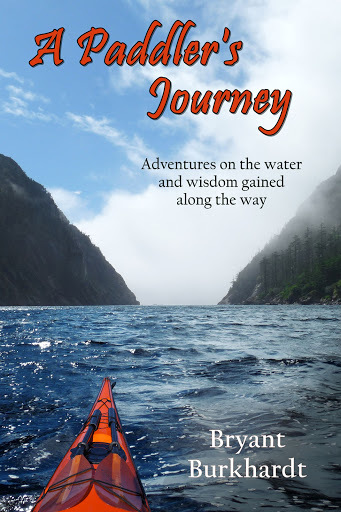 But you won’t constantly be pulling out a chart every time you need to decide whether to go through the rocks or around them, or whether to paddle next to Bob or up front with Mary. I think you need something a little simpler and quicker for the majority of small decisions that get made every time out on the water. The way I like to approach things is with a focus on PROBABILITY and CONSEQUENCE. Whenever I consider what could go wrong I also give it a likelihood. I could get attacked by a Great White at any time, but I know the odds are very remote so I don’t do much to adjust my behavior (though I don’t do rescue practice next to a rookery in the fall). A large set coming in after a lull is much more likely. If I paddle behind that rock how often does a wave big enough to break come by? Is it common for winds to pick up in the afternoon (yes!)? I use my past experience to estimate the likelihood of typical problems on the water and make my best guess as to what could happen. It isn’t perfect, but it isn’t random. Once aware of what can happen and how likely it is, you need to consider how bad it will be. If I do get hit by that big wave, would I be able to brace and ride it out or does it slam into more rocks? If something is likely to flip me, will I be able to roll up? If I end up swimming, how cold is the water, how warm am I dressed, how far would I have to go? If Jimmy gets tired or someone blows out a shoulder, do we have enough strong paddlers to tow them to safety? Do we have communication gear to call for help? While a lot can go wrong, most of it can be dealt with as long as you have the proper equipment and training. So when I see a risk I don’t have to automatically avoid it. I can choose to take it if I feel the reward is worth it and the consequences are acceptable. I don’t have a magic formula, but if there’s a high risk of something going wrong I still might try it if the negative outcome isn’t all that bad. Swimming into the beach on a sunny day certainly won’t ruin a surf session. But I stay away from low risk situations if the outcome is something I really don’t want to deal with, even if it’s unlikely. I stay away from rocks if I’m in my friend’s new composite kayak. I don’t go around that point if I know a squall could blow the group out to sea and it’s already getting late in the day. If it’s just me and my wife I’m much more conservative in my play, but with a larger group of skilled paddlers I know there are simply more resources to deal with whatever happens. You can practice this judgment in retrospect. While that includes looking at situations that went wrong, it’s just as important to review when things went right. Too many people assume that a lack of disaster indicates good decisions were made. That’s simply not true. If you survived the first round of Russian roulette, it hardly proves your thought process is sound and definitely doesn’t suggest the second round will be equally as successful. After every paddle take some time to consider the choices you made and think about how things turned out. Did you turn back in time? Was your route a good one? Did everyone have fun on the trip? Do you realize now that you would have been in real trouble if a large set came while you were exploring that cave? Reflection is the key to growth. If you can, include others in the review. A fine time to do this is with a beer in your hand after a large and satisfying meal (on the other hand, a bad time to do this is after several beers and one too many roadside tacos). It doesn’t have to be formal or structured, but pay attention to those who have more experience and listen to those who don’t say much. We all have war stories to share and most of them have a useful lesson buried in there somewhere. It’s fun and educational at the same time. You can normally spot the paddlers who are aware by watching their head. It swivels. They take in the whole 360. They’re the ones who saw the harbor porpoise, noticed Frank has a new paddle, and found the coolest slot to run. They’re having the most fun and make you want to paddle with them. That’s the paddler you want to be. The ones who always leave the decisions to others. The ones who are up for anything but often end up needing help. The ones who are surprised by what the ocean brings. Those are the paddlers you want to avoid. It’s an attitude. A choice. Being aware and making good judgments are skills to develop and practice. They go right along with a solid roll and the ability to back surf; with helping others carry boats and having extra chocolate at the lunch break. All things very much needed in this sport. Weather. Like it or not, you have to deal with it. While forecasts may not be perfect, these days there is a ton of information easily available to paddlers to help them anticipate conditions and be prepared for the worst. Most people do check the weather before they go paddle. They might even check the marine forecast if they live on the coast. But there’s a lot of information packed into those quick little descriptions and most people don’t really know how to interpret it. Let’s start by breaking down the basic information you want to have and then look at where to find it and how to use it. There’s a list of useful links at the end if you want to jump right to that. Of all the weather factors, wind has the greatest effect on kayakers. For most marine forecasts wind speed is given in knots (kt) and normally in a wide range, like 10 to 20 kt. First, you have to know what knots means, otherwise the forecast is useless. A knot is a nautical mile per hour and a nautical mile is a little longer than a statute mile – what we use on land. That makes knots a little stronger. 1 kt = 1.15 mph. So 10 kt is about 11 mph and 20 kt = 23 mph. What does that wind speed mean to you? You need to correlate a certain speed of wind with its effect on you as a paddler, and the best way to do that is after your paddle. When you get home from your local lake or bay paddle, look up what the winds were and start to equate the numbers to the experience. Did you have trouble with the wind? Was it annoying but tolerable? Did it force you to turn around? What did the water look like? We all have a general sense of what a strong wind is, but we can’t necessarily place a number on it. It’s time you learn how to do that. 10 kt of wind is a nice breeze but won’t affect your day much. 15 kt is enough to slow a kayaker down. Many paddlers have trouble making headway into a 20 kt wind (and there’s going to be whitewater everywhere). That means a forecast like 10 to 20 kt has a big range and you have to be ready for the high end. It also makes a big difference which way that wind is blowing. Of course it’s much easier to paddle with the wind, but your chosen route might not give you that option. If you start out with the wind, you’ll have to fight it on the way back – and what if it gets stronger? If you head into the wind at the beginning you’ll be able to turn around if it gets too strong. Onshore winds are most common but offshore winds can be dangerous because they’ll literally blow you out to sea. But it’s not just the wind’s effect on you that’s important. You need to know and prepare for what it will do to the ocean. Whitecaps start forming a little over 10 kt. At 20 kt there are breaking waves all over the place. The windwaves – the shorter, steeper waves that stack ON TOP of the swell – will be 2 to 4 ft. Even if you’re running with the wind, it will be a bumpy and chaotic ride. Just how rough also depends on how long the wind’s been blowing and from what direction. It takes time for wind waves to build up, so if there has been a 20 kt wind for three days straight it will be rougher out there than if it’s been building during the day and falling overnight (common along coastal areas). It also depends on whether it’s blowing in off the open ocean where it has more water (called fetch) to build up or if it’s blowing out to sea, in which case the waters nearest shore will be somewhat protected. Let’s start with the ‘easy’ part: wave height. For NOAA forecasts, the height is measured from the peak of the wave to the trough of the wave (if you’re a physicist like me, that’s twice the amplitude). Four feet may not seem big, but if you’re sitting in your kayak at the bottom of the swell then the peak of the wave is over your head. It’s also an average, so some waves will be bigger and some smaller. And it’s the forecast for the swell out in the ocean – what the surf is doing on shore could be vastly different. 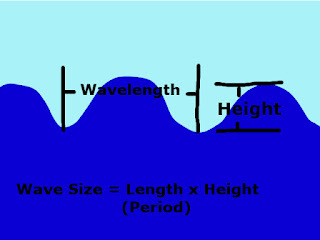 The period of the wave is actually one of the most important parts when trying to predict the size of the surf. Technically, the period of a wave is the time between one peak and the next, usually measured in seconds. More practically, it’s the length of the wave. 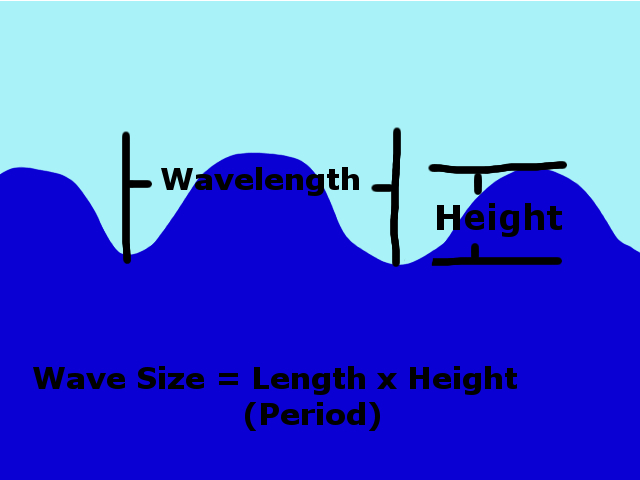 That matters because when a wave breaks on the beach (or your head if you’re sitting in the wrong place) the volume of water that comes crashing down depends on both the height and the length (think of it like a box: a tall, skinny box doesn’t hold as much as a medium, wide box). A fifteen second period wave will have about twice as much energy as an eight second period wave. That also means that the wave will jack up to a lot taller than four feet when it breaks (because of all that extra water in there). So the size of the surf will often be much larger than the size of the swell, and the longer the period the bigger it will be. But all that depends on the direction. Many beaches are partially shielded by points of land or reefs. If a beach is protected from the direction the waves are coming, it might actually have little to no surf at all. By choosing the right beach, I’ve launched on twenty foot days with only little ankle-biters to contend with. And I’ve had some great surfing with 2 ft at 18 second waves. Another thing to consider is that swells come from long distances, often storms thousands of miles away. It might take two weeks for the energy from a typhoon in Japan to hit the west coast of the U.S. At the same time, we might also be getting a swell from last week’s storm off Mexico. We often have two different swells, sometimes more, arriving at the same time from different directions. These mixed swells will create more variability in a system, often longer lulls and then bigger sets out of nowhere. A beach protected from a NW swell might be exposed to a S swell. 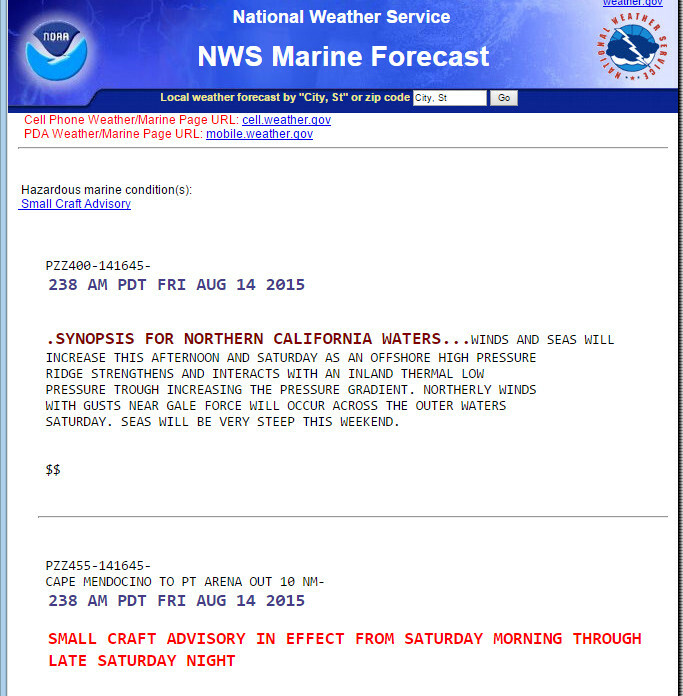 Finally, the NOAA forecast often lets you know if there’s some weather that could affect mariners. Fog is a common one. Rain is listed as well. While a little water in the sky doesn’t affect kayakers that much, fog can be a big deal. Losing sight of land can lead to disaster if you aren’t prepared, so always be prepared for fog. Slightly related but a different topic, you should also look up any relevant currents and tides. Many coastal areas don’t have significant currents, but any place with islands, channels, or restricted passages can have currents that completely change the game. Low and high tides mostly affect where you can land and launch – and how much mud you’ll have to slog through to reach the water. Both tides and currents can be looked up ahead of time, but do keep in mind that they are also predictions and the real conditions can vary significantly. Tide predictions are often affected by weather in general and snowmelt rates in particular near river mouths and estuaries, and changed tides equals changed currents. Getting back to wind and waves, those are the basic concepts. Now let’s take a look at an actual forecast and how you might want to use the information. TODAY NW WINDS 10 TO 20 KT. WAVES NW BUILDING TO 4 FT AT 11 SECONDS. PATCHY FOG. TONIGHT N WINDS 10 TO 20 KT. WAVES NW 6 FT AT 8 SECONDS... AND S 2 FT AT 12 SECONDS. PATCHY FOG. SAT N WINDS 10 TO 20 KT. WAVES NW 7 FT AT 8 SECONDS...AND SW 2 FT AT 14 SECONDS. PATCHY FOG. A few technical notes before we dig in. This particular forecast covers an area almost seventy miles long and ten miles out to sea. That’s a lot of ocean and it’s not all going to have the same weather. Some areas will be worse and some better. It takes a while to get a sense of how a specific area relates to a general forecast. Until then, err on the side of caution and assume the worst. You might also notice the ‘Small Craft Advisory’ in this forecast. The standard for that varies by region. It’s normally waves over ten feet and winds over 20 kt. 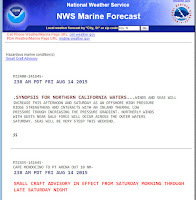 We don’t have that here but we get the advisory anyway, probably because it’s summer and people are used to milder conditions and more non-locals are likely to be hitting the water. Like everything else about these forecasts, it takes some time and experience to interpret what appear to be simple numbers and statements. The forecast for TODAY starts with the typical NW winds 10 to 20 kt. I probably see that more than anything else here in California. As mentioned above, the 10 to 20 range covers a lot of different wind. The NW is the direction the wind is COMING FROM, again our usual here in CA. This could mean a relatively mild day or it could mean a fairly rough day. The general description talks about a building high pressure and steep waves. Combine that with a small craft advisory for the following day and I think a rough day is more likely so I’d plan for that. But it’s vague enough that I’d want more data. We normally paddle much closer to shore than ten miles out, so our wind is often closer to what coastal towns experience than what the marine forecast calls for. The forecast for the town of Mendocino called for 12 mph winds. If I were planning a paddle, I’d look to stay near shore and start out heading north. Another great place to get more detailed wind forecasts is from sailing sites. Sailors obsess over winds the way surfers obsess over waves, so a good sail forecast will be much more detailed in both location and timing compared to a general mariner’s. These are often location specific so do a google search for winds and sailing in your area and see what you can come up with. But let’s move on to the waves. The swell for TODAY is waves NW building to 4 ft at 11 seconds. As with the wind, the direction, NW, is the direction the waves are COMING FROM. Building says that the swell is increasing – important to know that whatever it looks like in the morning it is expected to be bigger later on. 4 ft is the height of the swell – but not necessarily the surf. 11 seconds is a moderate period (7 or 8 is short, 20 is really long). One important thing to note is that the swell is predicted to increase overnight and into the next day. Generally larger waves travel faster than smaller waves, so quite often when the swell is building you’ll find that some of the larger sets hit much earlier than the main swell. In this case, there’s a good chance you’ll have a few 6 ft waves TODAY and some 8 ft waves hitting TONIGHT. Be prepared for those outliers. There’s also the S swell that is forecasted for TONIGHT. 2 FT is pretty small, even at 12 seconds, but it’s enough to change the dynamics on the beaches or areas that are protected from the NW. It also adds to the overall variance in size of waves. If you were out rock gardening, it would mean you should spend a little extra time watching features before you commit yourself. Every ten minutes, every twenty minutes, you’re likely to get some waves significantly bigger than usual. For my area, this is a relatively small swell from a typical direction. Some surf sites might be working, lots of rock gardening will be possible. Before I chose my location I’d like a little more data. This time our surfer friends come through. Their sites and forecasts almost always give us what we really need for the swell: exact direction and surf height. NW is pretty general, and some breaks work when it’s more westerly and some when it’s northerly. Surf sites will often break down swell direction into degrees, so instead of simply saying it’s from the NW, they’ll tell you it’s from 278 degrees. That’s a lot different than 321. They also tell you the size of the surf, which is important if you plan to launch or land from the beach. It will let you know if that long period component is going to make the waves big near shore. Keep in mind that each beach is different so small surf at one beach in the forecast doesn’t mean it will be small everywhere. If you can’t find a surf forecast for your exact beach, look for a nearby one, but more importantly – look for one facing the same direction. For all of this, keep in mind that forecasts are just someone’s best guess of what will happen. Some are more reliable than others, but they all have errors. One good thing to get in the habit of doing is to look at the actual conditions at the moment. Look at buoy data to see what the swell is doing. Look at wind readings to see how it’s blowing. If a forecast called for a small craft advisory starting in the afternoon, but you see that it’s already 20 kt with 6 ft swell at 8am, you can be sure that the heavy weather is already here. On the other hand, if I’m headed out for a short paddle and the wind is currently calm down at the beach, I might try to rush out and get my time in before it hits. All of this is really for day paddles. If you’re going on an expedition where you’ll be out for days or weeks at a time you’ll need a much better sense of weather patterns for an area and how to draw conclusions with minimal information. These days, some of the big-time expeditioners use satellite communications to stay in touch with a weather researcher back home who puts together all the info and creates a specific forecast for their route. You don’t have to go that far, but it doesn’t take much to look up a few sites and know how to interpret the information there. Get used to looking up forecasts before you go. Many disasters have started with kayakers on a beach deciding things look fine at the moment even though the prediction is for things to deteriorate. You make your go/no-go decisions based on the future, not the present, and you always consider the high side of the forecast, not the low. It will save you time, make your paddling easier and more fun, and keep you safer. Got any great forecast resources? Share a link in the comments! It ain't luck - it's hard work. I read a comment the other day directed at a friend of mine. He’s a full-time professional kayak instructor, something I used to be (I only teach part-time these days). It was meant as a compliment and went something like this: ‘you’re so lucky – you get paid to play in boats all day’. It’s a sentiment I’ve heard many times, and while I know it’s always coming from someone trying to be appreciative and nice, it never sits well with me. It often comes with a follow-up sigh and 'I wish I could do that' - suggesting they have too many responsibilities or lack the 'luck' needed to enjoy what they do for a living. First, not even professional kayakers get paid for paddling. They get paid to film their exploits, to talk about their sponsors, to show up at events and perform well. Instructors get paid to teach. On the same stretch of water over and over again, always holding themselves back so others can play. Skipping that play wave because the students aren't ready for it, staying away from that pourover because it's too intimidating. In advanced classes they might get to let loose a little, but the consequences are more severe and it requires an even keener attention to safety. I’m not saying they don’t enjoy it. They most certainly do. But teaching is a lot of responsibility. They’re looking after the safety of their students, often in very dynamic and challenging environments. They’re watching everybody and everything, and have to deal with frightened newbies, over-confident intermediates, outside boat traffic, changing weather conditions, physical injuries, and a myriad of other considerations that affect the day. They’re doing their best to read the emotions and responses of their class and adapt their game plan to best achieve the desired result: happy students. And that’s the fun part of the job. Because if they’re making a living doing that, whether it’s running their own kayak school or working full time for someone else, they have to be doing a lot of work behind the scenes. The money might exchange hands during the class, but what they’re getting paid for includes web design, boat repairs, location permit applications, class scheduling, curriculum design, marketing and advertising, and all the little things that add up to a ton of work to run a successful business. They don’t have an off-season, they have an off-the-water season. And you could do it too if you wanted. That's the other part that rubs me wrong: the idea that us instructors were either blessed with some rare gift to be able to teach or made some choice to abandon their normal responsibilities to live a care-free existence on the water. It often comes from those who have high-paying jobs that they complain about. There's a hint of jealousy in their voice. But those who say it have a life filled with choices and opportunities, so to suggest that someone else has something you want, and they're lucky for having it, when you could have the same if you were willing to work as hard as they did, comes off as a little dismissive. I know a lot of professional instructors. Some of the best in the business. There aren’t really that many of them because it’s a very difficult thing to make a living at. I can tell you for certain that none of them got where they are today through luck. Maybe they got some lucky breaks in life – we all do – but to get to the point where you can earn a living through teaching kayaking takes years of hard work and dedication. They've earned their job. And I’m not talking about kayaking skills. It does take time and effort to get those too, but that is the fun part. I know a lot more expert kayakers than professional instructors, and both groups deserve credit for developing their skills to a point where they can kayak hard rivers or play big in the ocean. But most of those paddlers don’t have the skills to be great instructors. They might have the abilities, they often have the potential, but you only get to be a great instructor by working very hard at the quite separate skills that go into teaching as opposed to kayaking. The great instructors you know have taken classes on how to teach. They’ve spent years and often lots of money acquiring high levels of certification. They think about how to improve while they’re off the water and talk about it with other instructors. Most importantly, they’ve taken time away from going out kayaking ‘for fun’ to teach other people how to kayak. Teaching certainly can be as fun and rewarding as kayaking, but it's in a different way. The joy of paddling is a very personal thing you experience through your own actions. The joy of teaching comes from your students. You can teach the hell out of a subject, nail all your demos and find the perfect venue for a skill – but none of that matters if your students aren't enjoying themselves and learning. Luck isn’t what gets you to that point. It takes a conscious decision to dedicate yourself to helping others learn about the sport. Turning down fun paddling trips because you have a job to do. Paddling more class II than any beginner ever has and spending countless hours paddling painfully slow on flat water so the students can keep up. Not to mention the time spent in cold water demo-ing rescues or helping braces. Lifting boats, attaining up-river, sharing your gear, and smiling at the end of a twelve hour day. No one wins the instructor-lottery and is instantly handed the tools and desire it requires to inspire other people and safely introduce them to our wonderful sport. Most people are kind and genuinely want to compliment their instructors. They do see the skills and are thankful for the help and effort that instructors put in. So the next time you’re taking a class from one of these hard-working and generous individuals, feel free show your appreciation. Tell them they have a great website. Help them unload gear. Make sure to return that beanie you borrowed when you got cold. Maybe compliment the choices they’ve made in their life to get to that point. Don't confuse what they do with playing around. Don’t tell them they’re lucky - they already know that. 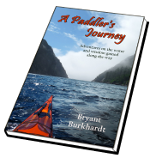 A Paddler's Journey Now on Sale! For my blog readers: use the code XUW6M6ZV to get $3.00 off!